I am full of joy to be here with you today on this glorious day. Please indulge my childlike enthusiasm here. I have succumbed to spring folly. Whilst March is usually the month of hares I have been busy dreaming about rabbits. and finally, Mademoiselle Jardin anglais and Mademoiselle Primavera. These two have become good friends. I started making these five -and it has been such a pleasure - a few weeks ago for a very special couple - Sylvie and Xavier - who have brought happiness into our family's life. When we first arrived in Touraine in July 2009 I spent a year wandering like a lost soul looking for the perfect resting place. I found plenty of gardens of course. What a multitude of Edens there are nestled in the idyllic countryside on both the north and south banks of the Loire river. (Can you imagine how excited I am that the garden season is soon upon us? I cannot wait to share some of its magic with you.) The kind of place I am referring to here however is a special café or tea room to which you are drawn. A place with the best quality products, beautiful, comfortable surroundings and warm people. We found it in June 2010. A newly built little corner of heaven most aptly built opposite the eleventh-century village church (how did they get planning permission for that, you might ask yourselves) just down the hill from our house. This is Xavier hanging up the freshly concoted menu for lunch and his wife Sylvie is preparing blinis. A perfect mix of restaurant, café and grocery shop which is also a space for exhibitions. Wouldn't you love to come here for a drink and a chat? I wish you could! You would immediately understand my fondness for this lovingly crafted place which has become a success over the past two years. 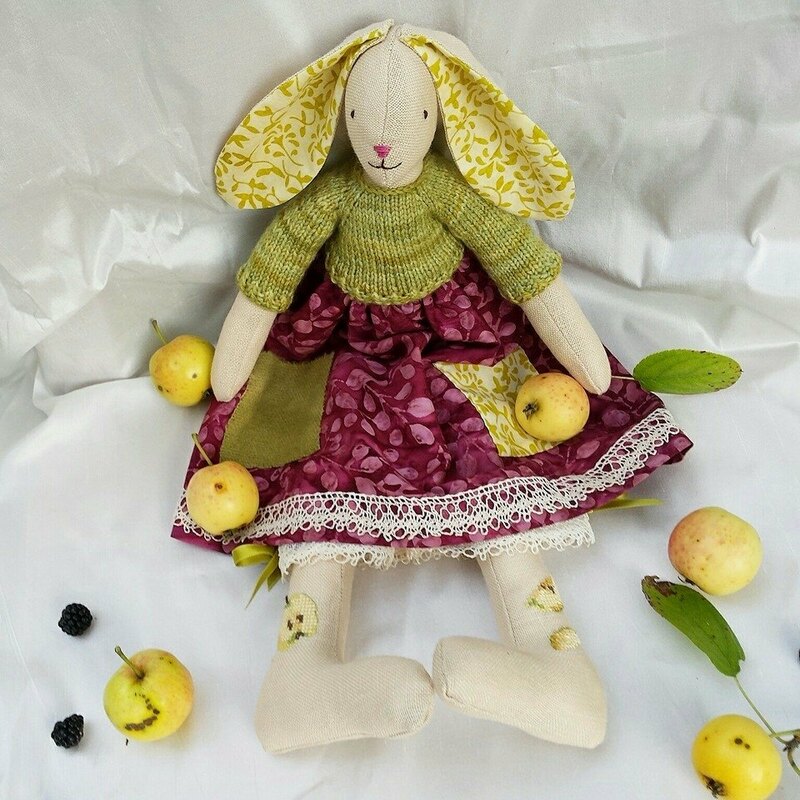 Sylvie (pictured above) asked me if I could create a few rabbits for their shop to bring a bit of spring fever into the place. A sort of pre-Easter exhibition with a garden theme. I was delighted and so set to work often late in the evenings after the children were in bed and during quiet moments carved out of our busy lives thanks to Mickaël, my dear, patient husband. These rabbits of mine are a little strange looking but their long, slender bodies lend themselves well to carefully stitched clothes and a little ornamentation. There is also a beautiful walled garden arround this sunlit terrace with a large, gnarled apple tree which casts shade on this otherwise hot place in summer. Sylvie and Xavier are passionate about gardening as well as food and art. They really are the most wonderful of people. I thank them both for giving me the chance to make some spring creatures for La Part Belle - which translates roughly into English as "The Best Portion" or "The Choice Slice" - and look forward to spending many, many happy moments in their company. Thank you all so very, very much for your sweetly worded comments on my last post. I still feel a need a little more time but I shall be back soonish. In the meantime I will continue to visit your little corners of pleasure and I am so grateful you take the time to visit me here. We have become spectators to "the endless ballet of the weather", as the poet George Mackay Brown put it. There have been severe frosts, boisterous winds, generous spatters of rain, racing clouds and - the show stealer - warm sunshine and a big, blue sky. We are on the cusp of spring. Every year in those early days of timid budding and unfurling when the spring garden wakes slowly like a sleeping village I feel myself becoming jittery and a little anxious. I am entoxicated by the POTENTIAL of spring. As new plants raise their colours every day an uncontrollable urge to create overcomes me. I don't question it. I lived in Greece for two years and experienced almost helplessly the potent impact of the sap rising in warmer climes. There is little one can do to resist! If I allow myself to yield to the desire to pay tribute to the glorious pagent our gardens stage for us in my articles on gardening aesthetics and with my very modest crafting skills I am mindful of the need to maintain a (fragile) sense of equilibrium. On the best of days my husband and children watch me run around like a headless chicken between sewing baskets, teetering piles of yarn, and my treasured reference books during every moment set apart from the daily management of our family life. I talk to them of my ever growing catalogue of projects in my head and they nod and smile and offer wise advice. Mostly they understand me and for that I am hugely grateful. But as spring jumps at me I must be mindful of remaining focused or I run the risk of spreading myself too thin. My focus must be on important projects alone and most importantly my family for their desires and plans are worthy of great respect too and an ear capable of truly listening. There is also Gaspard our puppy who is growing beautifully and at three months needs a constant eye and to be trained not to jump onto people. Any advice on that? It is a mixed blessing that we rent our present house. While its garden is perfectly lovely with its cherry trees and silver birches and ideal for children to run around in we cannot invest energy in putting our horticultural dreams into fruition here. All we need to do is to trim hedges, cut back the profuse lavender bushes and eat cherries in May. We must wait patiently for our own garden. Frustrating? Yes. However I am grateful in a sense for this year I simply wouldn't have the time to do it all. In the meantime I garden with words. One Tiny Tea Leaves simply is not enough and so I made this second one, named Viola, for Angelique. It is a little longer in length than her first so that she may wear it for longer in time. Also this Madelinetosh DK in Sugar Plum (has anyone every actually eaten a sugar plum?) seems softer and more delectable than all other skeins I have purchased previously so knitting a bigger Tea Leaves made the pleasure last! For those who are interested the details are on Ravelry. Angélique's new cardigan goes beautifully with her new rainboots purchased on the same day as the Viola above in our local gardening centre. Most satisfying. At this time of year you will also see me bent double over the damp earth under our garden trees looking for Viola odorata. It's like finding coins in the grass only better. The violets captured here are Violettes de Toulouse purchased on a whim at the wonderful flower market in Tours which stretches along one of the main avenues two days a week. Heaven. I have already promised Angélique we will walk alongside the vines and orchards in search of tiny wild violets. * Why these flowers with their heart-shaped leaves are referred to as modest or humble escapes me. They are quite simply beautiful and their elusive scent on a fresh spring morning could charm away the most malevolent of spirits. Some spring days I would like to replace our grass with a flowery mead, the carpet of tiny flowers you find in Medieval and fifteenth-century paintings. Cultivated meadows were filled with small blooms: viola, violets, periwinkle, lily of the valley, columbine, birdsfoot trefoil and cowslip were some of the flowers to be planted. although I own this version. But where are my manners? I almost forgot to give you the names of my two giveaway winners. Vanessa from Coco Rose Diaries and... oh dear, can you not read the second name there? Dear Elizabeth and Vanessa congratulations! I will be sending you the Perrault books and embroidery respectively. Please send me your postal addresses via e-mail when you have a spare moment. I will be taking a step away from my space here for a while. It's all about focus, remember? ;-) I will not be able to resist the temptation of visiting your blogs though from time to time and I will return in the first official days of spring to show you what I have been concentrating and working on recently. My modest tribute to glorious spring. Thank you from the bottom of my heart for taking the time to visit this humble blog of mine.